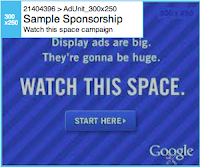 to view your AdSense performance and control your ads. If you also use DoubleClick for Publishers (DFP) Small Business, we’re pleased to let you know that your DFP account can now also be directly integrated with the Google Publisher Toolbar. The Toolbar is a Chrome extension that gives you a clear overview of which ads are serving on your site and why, through an overlay for each ad showing which line item and creative was served. You can get more information by clicking on any overlay. When you sign in to the Toolbar, you’ll see complete information on each ad -- regardless of whether AdSense or DFP served the ad. Please visit our Toolbar Help Center article for further information and support. Download the Toolbar and start using it with DFP Small Business today. We're continuing to improve support for DFP in the Toolbar, and are always happy to hear your feedback. Many of you are already using the Google Publisher Toolbar to view your AdSense performance and control your ads. If you also use DoubleClick for Publishers (DFP) Small Business, we’re pleased to let you know that your DFP account can now also be directly integrated with the Google Publisher Toolbar.